History is so much more than just dates and facts. It’s about people. Real, flesh and blood people . When I think of the Reformers — especially Martin Luther, words like strong, unyielding, and uncompromising come to mind. The Reformers, like the Puritans, were men of great spiritual stature. They stood, as JI Packer has said, like “towering Redwoods”. Yet, it is also true that, like all historical figures, they were not one-dimensional characters. Talented and gifted? Yes. But also imperfect, frail, limited, and vulnerable. 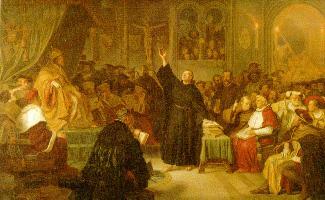 At The Diet of Worms, the assembly presented Luther with his own writings. They then wanted to know two things: (1) Are you the author? and, (2) Do you still stand by the contents? In an almost inaudible voice Luther admitted to authorship but asked for additional time to consider a response to the second question. They agreed and Luther retreated in seclusion. RC Sproul, in his series, “Justification by Faith” calls this moment in Luther’s life, “Luther’s Gethsemane”. Below is his plea for help. This desperate, heavenly appeal reminds us that there is indeed a human element to history. “O God, Almighty God Everlasting! How dreadful is the world! Behold how its mouth opens to swallow me up, and how small is my faith in Thee! . . . Oh! the weakness of the flesh, and the power of Satan! If I am to depend upon any strength of this world – all is over . . . The knell is struck . . . Sentence is gone forth . . . O God! O God! O thou, my God! help me against the wisdom of this world. Do this, I beseech thee; thou shouldst do this . . . by thy own mighty power . . . The work is not mine, but Thine. I have no business here . . . I have nothing to contend for with these great men of the world! I would gladly pass my days in happiness and peace. But the cause is Thine . . . And it is righteous and everlasting! O Lord! help me! O faithful and unchangeable God! I lean not upon man. It were vain! Whatever is of man is tottering, whatever proceeds from him must fail. My God! my God! dost thou not hear? My God! art thou no longer living? Nay, thou canst not die. Thou dost but hide Thyself. Thou hast chosen me for this work. I know it! . . . Therefore, O God, accomplish thine own will! Forsake me not, for the sake of thy well-beloved Son, Jesus Christ, my defence, my buckler, and my stronghold. Can’t you just hear the fear and trembling of this man’s soul? Luther’s prayer also confirms something else – that is, our faith rests not in men but in the unchanging and Almighty God they served. Praise God for strengthening Luther and depositing in him the courage and faith to return and stand alone for truth. Now that my friends, in my book, calls for a hearty and loud, Soli Deo Gloria! What a great encouraging prayer! It is like reading some of David’s prayers. We can know and ought to acknowledge that even those men of God we call “great” were as great in their fear and weakness as in their faith– that they were, at their best, yet but mere mortal men, encased in sin-weakened flesh, whose fate they knew was in the hands of Almighty God, and who occasioned doubt of Him and fear of being without Him, but whom He never failed. What a wonderful post, my friend. “Luther’s prayer also confirms something else – that is, our faith rests not in men but in the unchanging and Almighty God…” and how utterly important our prayers are! Loving you! Thanks for sharing this, Christina. These great men of the faith were such because they had faith in a great God. What you said about history is so true … it really is made up of real people — just like us. I think that’s why reading of the saints of old can bring such encouragement to us now. Love you! Thanks sis…. Soli Deo Gloria!